We've seen affordable field recorders from Edirol and M-Audio. How does Zoom's H4 compare? As a location sound recordist, it's great to have top-notch kit for recording on-set, or gathering samples to use in post-production. I tend to use high-end equipment designed specifically for film and TV work, but you inevitably come to a point where you're asked to achieve the near-impossible on a regular basis with the easiest (which to 'the Producers' means cheapest) of tools. So, recently, I've been looking for the sound recordist's equivalent of a compact camera that I can whip out when that little interesting noise comes along, and when Sound On Sound asked if I could review the Zoom H4, how could I say no? 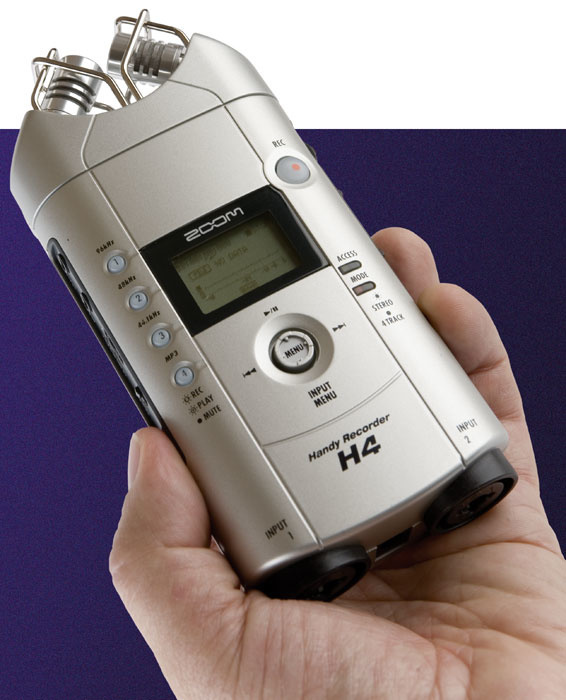 The Zoom H4 is a handheld solid-state recorder with built-in stereo mic, two combi XLR/quarter-inch jack inputs and USB output. The entire unit measures 70 x 152.7 x 35mm, and looks rather like a device you'd use to stun the Invaders From Mars. Once the box arrived, I took a quick spin through the manual and fired up the recorder. It runs on just two AA batteries, though you have the option of 9V DC power from the supplied transformer, and records onto SD cards. A 128MB card is supplied, but you can now get 2GB cards fairly cheaply. Two batteries will give you about four hours' recording time, so a cheap 'Dirty Dozen' will give you a full 24 hours' recording. However, there's no meter to show you how much power remains, which is a pity. Two cardioid mics, in a sort of X-Y configuration, are located at the top, protected by a little cage-like structure, on top of which sits the supplied foam windshield: a welcome addition that you will definitely need outdoors. The two jack/XLR inputs at the bottom can serve either as mic inputs with phantom power, as line inputs, or as high-impedance inputs for connecting electric guitars and the like. The menu is displayed on a green LCD screen showing time, transport status, file name, a set of meters and a little A-B icon at the bottom of the main page. There are two menu controlling buttons, similar to controls found on some mobile phones. The first is a mini-button/joystick affair on the front, which controls play and pause/stop, shuttle forward and shuttle backward. You can also press the centre of the button and access the menu, and pressing down puts you into the input menu page directly. The second navigating button is a jog dial on the right-hand side of the unit. This navigates up and down the main page options, and across each page's function. Pressing in with the side jog dial highlights the given item, allowing it to be altered. Confused? I was — I couldn't see the need for separate dials for navigating and accessing menu functions, when a single, well thought-out one would have done. To be fair, though, once I overcame that, I found it fast enough to navigate through the menu options. On the left of the H4 are four buttons that let you flick instantly between MP3, 16-bit/44.1kHz, 16-bit/48kHz and 24-bit/96kHz PCM formats. The MP3 settings run from 48 to 320 bits with the option of variable bit rate, and default to the last rate you used. 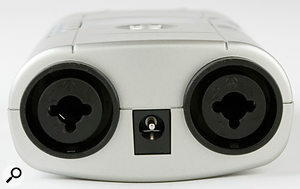 The four buttons also come into play when using the Zoom in multitracking mode. Yes, you heard me right: the H4 also has the power to be a four-track in your pocket! Furthermore, two effects units are built-in, and cover a large range of preset effects, from mic and amp simulators, through the usual modulation, reverb and delay effects, to compression and limiting. This makes the H4 much more than a recorder, and it will no doubt prove a hit with people or bands looking for a songwriting sketchpad. The unit came to me just in time for me to run out to test it on my next job, which was to record an interview with some celebrity types for an awards show. The Zoom H4 includes two jack/XLR combi sockets that are capable of providing 48V phantom power.Photo: Mike CameronOn the way there I got going with a few ambience recordings on the Mean Streets and in the crew car, generally filling up the SD card with quick and dirty tests of how the unit held up. One of the things I wanted to test straight away was the inevitable handling noise that any recorder with onboard mics will have. Given that the H4 is built from plastic, I had expected plenty of handling noise, but I was actually pleasantly surprised at its performance. While it certainly is susceptible to the fumble test, the intensity of the noise was quite adequate. Recording-wise, it did a great job in handling jackhammers at five paces, so I'm sure it will be equally at home getting quick and dirty recordings of your band's gig! The fidelity of the mics was very impressive for a unit in this very low price range. Obviously, the quality was not comparable with the kind of German engineering I would be comfortable with for a big recording session, and I found them lacking in what some people call 'body'. Also, understandably, the very edges of the low-frequency range were a little lost in translation, but for the £279 asking price (even lower on the high street), it was perfectly acceptable. I'd be confident of being able to capture samples of a quality that could be used in post-production, or as sound effects in music. While it would be possible to get better quality (and I would prefer the option of doing so for critical sounds at the forefront of a mix) the H4's cost and convenience more than make up for it. Happily, the H4 also provides powered inputs for external microphones, so I decided to test it out with my Schoeps CCM41 and a Rode NT4 stereo mic. The option to switch on phantom power is buried in the menu system, and you have the option of +30V or +48V, presumably to help you manage your power consumption. The recordings were obviously improved by the use of good-quality external mics, but it has to be said that the preamps seemed to give the same slightly 'light' sound even with these mics. Still, I consider that more than fine, considering what price bracket we're looking at, and in some circumstances it might even help multi-source projects 'sit' better with each other! Setting levels for a line-level signal was, again, a slight fiddle, but it worked fine, and the ability to record at line levels could prove very useful for feeding a live desk mix from your gig through the unit to review your performance, or even for making rough podcast files ready to upload to a band web site. It's a shame, however, that you can't use the multitrack function with four separate live inputs, as that would enable you to use a line from the live desk and the mics on the front simultaneously, to add a bit of 'life'. Perhaps a future update will make that a prospect. I've been looking into getting something like this for my sound effects-building needs, and have kept my eye on the higher-end handhelds, like Nagra's Ares M or the Sony PCM D1. The Zoom doesn't aim to compete in that price range, but certainly does a sterling job keeping up and I am currently considering adding it to my kit bag. There are a few comparably priced recorders. The Edirol R9 is a similar recorder, but is two-track-only. It also records onto SD cards, at the same MP3 rates as the H4, but WAV files are limited to 48kHz (though arguably that's not a problem: how many high-resolution projects will really be mastered on a Zoom H4?). The M-Audio Microtrack arguably has a higher spec, but is also a two-track-only pocket recorder. It records onto Compact Flash cards, but requires an external mic. Also, it runs on a rechargable lithium ion battery, or takes its power via USB or a 9 Volt power supply, so there's no on-the-road option of slipping in a new set of AA batteries. Neither of these units offers the effects or musical functionality of the H4. More extensive functionality than a Swiss Army knife! Mic, line and high-impedance inputs, as well as built-in mics. Easy to use: just point and go. Not very quick at setting levels. The H4 covers a multitude of uses. If you are looking for something with line, mic and high-impedance inputs that covers a multitude of uses (recording samples on the hoof, gig taping, four-track recording, sketching out compositions), it is definitely worth a look.